This is the paperback edition of Talking Mysteries: A Conversation with Tony Hillerman, published by University of New Mexico press in Albuquerque, NM. 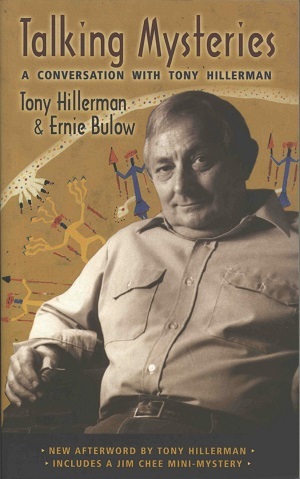 This volume is a revised and rearranged version of Words, Weather and Wolfmen and contains an autobiographical essay by Hillerman entitled "Mystery, Country Boys and the Big Reservation," an in depth interview with Tony Hillerman by Ernie Bulow, and a Jim Chee mini mystery called "The Witch, Yazzie and the Nice of Clubs" and 12 illustrations inspired by Thief of Time, by artist Ernest Franklin. In addition, several photos of Tony Hillerman and a map of "Hillerman's territory" which marks locations mentioned in the Navajo mystery novels have been added. This paperback edition also includes an afterword, written by Tony Hillerman. Binding: Paper covers with full color illustration and a black and white photograph on the front cover.